This article is about the quadrilateral shape. For the album by Linda Perhacs, see Parallelograms (album). This parallelogram is a rhomboid as it has no right angles and unequal sides. In Euclidean geometry, a parallelogram is a simple (non-self-intersecting) quadrilateral with two pairs of parallel sides. The opposite or facing sides of a parallelogram are of equal length and the opposite angles of a parallelogram are of equal measure. The congruence of opposite sides and opposite angles is a direct consequence of the Euclidean parallel postulate and neither condition can be proven without appealing to the Euclidean parallel postulate or one of its equivalent formulations. By comparison, a quadrilateral with just one pair of parallel sides is a trapezoid in American English or a trapezium in British English. The three-dimensional counterpart of a parallelogram is a parallelepiped. The etymology (in Greek παραλληλ-όγραμμον, a shape "of parallel lines") reflects the definition. Rhombus – A parallelogram with four sides of equal length. Square – A parallelogram with four sides of equal length and angles of equal size (right angles). Two pairs of opposite sides are equal in length. Two pairs of opposite angles are equal in measure. One pair of opposite sides are parallel and equal in length. Each diagonal divides the quadrilateral into two congruent triangles. It has rotational symmetry of order 2. 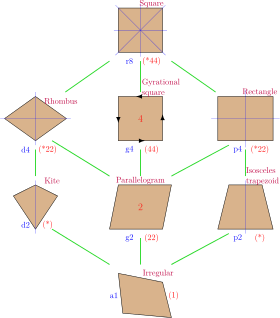 Thus all parallelograms have all the properties listed above, and conversely, if just one of these statements is true in a simple quadrilateral, then it is a parallelogram. Opposite sides of a parallelogram are parallel (by definition) and so will never intersect. The area of a parallelogram is twice the area of a triangle created by one of its diagonals. The area of a parallelogram is also equal to the magnitude of the vector cross product of two adjacent sides. Any line through the midpoint of a parallelogram bisects the area. Any non-degenerate affine transformation takes a parallelogram to another parallelogram. A parallelogram has rotational symmetry of order 2 (through 180°) (or order 4 if a square). If it also has exactly two lines of reflectional symmetry then it must be a rhombus or an oblong (a non-square rectangle). If it has four lines of reflectional symmetry, it is a square. The perimeter of a parallelogram is 2(a + b) where a and b are the lengths of adjacent sides. Unlike any other convex polygon, a parallelogram cannot be inscribed in any triangle with less than twice its area. 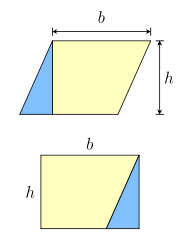 If two lines parallel to sides of a parallelogram are constructed concurrent to a diagonal, then the parallelograms formed on opposite sides of that diagonal are equal in area. The diagonals of a parallelogram divide it into four triangles of equal area. Animation for the area formula . where and the leading factor 2 comes from the fact that the number of congruent triangles that the chosen diagonal divides the parallelogram into is two. Let vectors and let denote the matrix with elements of a and b. Then the area of the parallelogram generated by a and b is equal to . Let vectors and let . Then the area of the parallelogram generated by a and b is equal to . (alternate interior angles are equal in measure). (since these are angles that a transversal makes with parallel lines AB and DC). Also, side AB is equal in length to side DC, since opposite sides of a parallelogram are equal in length. Therefore triangles ABE and CDE are congruent (ASA postulate, two corresponding angles and the included side). Since the diagonals AC and BD divide each other into segments of equal length, the diagonals bisect each other. Separately, since the diagonals AC and BD bisect each other at point E, point E is the midpoint of each diagonal. An automedian triangle is one whose medians are in the same proportions as its sides (though in a different order). If ABC is an automedian triangle in which vertex A stands opposite the side a, G is the centroid (where the three medians of ABC intersect), and AL is one of the extended medians of ABC with L lying on the circumcircle of ABC, then BGCL is a parallelogram. The midpoints of the sides of an arbitrary quadrilateral are the vertices of a parallelogram, called its Varignon parallelogram. If the quadrilateral is convex or concave (that is, not self-intersecting), then the area of the Varignon parallelogram is half the area of the quadrilateral. For an ellipse, two diameters are said to be conjugate if and only if the tangent line to the ellipse at an endpoint of one diameter is parallel to the other diameter. Each pair of conjugate diameters of an ellipse has a corresponding tangent parallelogram, sometimes called a bounding parallelogram, formed by the tangent lines to the ellipse at the four endpoints of the conjugate diameters. All tangent parallelograms for a given ellipse have the same area. It is possible to reconstruct an ellipse from any pair of conjugate diameters, or from any tangent parallelogram. A parallelepiped is a three-dimensional figure whose six faces are parallelograms. ↑ Owen Byer, Felix Lazebnik and Deirdre Smeltzer, Methods for Euclidean Geometry, Mathematical Association of America, 2010, pp. 51-52. ↑ Zalman Usiskin and Jennifer Griffin, "The Classification of Quadrilaterals. A Study of Definition", Information Age Publishing, 2008, p. 22. ↑ Chen, Zhibo, and Liang, Tian. "The converse of Viviani's theorem", The College Mathematics Journal 37(5), 2006, pp. 390–391. ↑ Dunn, J.A., and J.E. Pretty, "Halving a triangle", Mathematical Gazette 56, May 1972, p. 105. ↑ Mitchell, Douglas W., "The area of a quadrilateral", Mathematical Gazette, July 2009. Wikimedia Commons has media related to Parallelograms. Weisstein, Eric W. "Parallelogram". MathWorld.